They've got little in common thematically, but it's tough not to compare Michael Mann's The Jericho Mile (1979) with Steven Spielberg's Duel: both are outstanding made-for-TV films shot during the same decade by future A-list directors, providing a glimpse of their obvious talent before going on to bigger and better things. 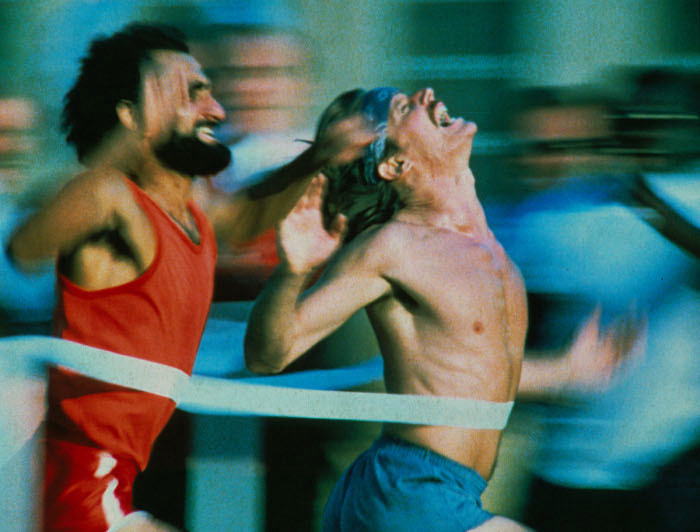 Otherwise, they couldn't be more different: Duel is a tense game of cat-and-mouse in the desert, while The Jericho Mile is a race-relations drama in which convicted murderer Larry Murphy (Peter Strauss) runs fast enough to be an Olympic hopeful. Murphy, nicknamed "Lickety Split" by the other inmates, has made enemies by refusing to join a gang...but really, he's just running from himself. 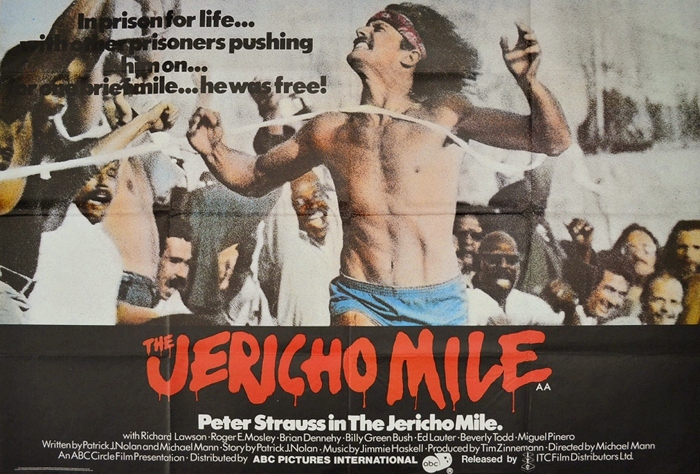 Shot on location in Folsom Prison among its guards and inmates, The Jericho Mile strikes a balance between sports drama and case study: it's not long before Murphy is a minor celebrity for his achievements...but his association with "next-door neighbor" R.C. Stiles (Richard Lawson), a black inmate awaiting a visit from his wife and baby daughter, doesn't sit well with white gang leader "Dr. D" (Brian Dennehy) after a deal goes bad. Murphy's checkered past also comes under review with the Olympic board, and it just might keep him out of competition. Not for lack of trying, however: state coach Jerry Beloit (the late Ed Lauter) works with Warden Earl Gulliver (Billy Green Bush) to have a track built on the prison grounds, and the inmates are invited to volunteer in exchange for special privileges. 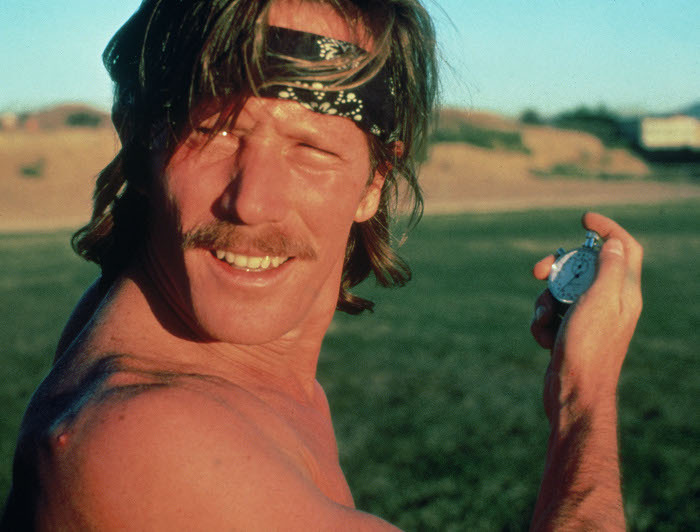 All the while, Murphy trains like a madman, and we learn more about his past via sessions with Dr. Bill Janowski (the late Geoffrey Lewis). There's more to The Jericho Mile than that, and it's a credit that most elements in this well-constructed film flow so smoothly in just 96 minutes. It's got a solid structure, even pacing, and memorable performances from its cast of leads, character actors, and amateurs (not to mention great editing by Arthur Schmidt, who would go on to edit many films by Robert Zemeckis including Back to the Future and Cast Away). But what I liked most about The Jericho Mile is its commitment to the present: there are no overwrought flashbacks to Murphy's crime, sentencing, or first years in prison, creating a focused snapshot of what's happening in this chapter of his life. While one or two side stories feel slightly under-cooked and some of its slang hasn't exactly aged well, this is a rock-solid drama that new and returning fans can still enjoy. Kino's new Blu-ray is a cause for celebration, as The Jericho Mile has been limited to broadcast resolution or VHS since 1979 -- unless, of course, you were a die-hard fan with a region-free DVD player. Either way, those earlier formats are all inferior to this new disc, which is sourced from a new scan of the original negative and even features an audio commentary for added value. There's still some room for improvement in certain areas, but established fans and curious newcomers alike should find a lot to like here. Presented in its original 1.33:1 aspect ratio, The Jericho Mile looks even better than expected on Kino's new Blu-ray. This made-for-TV production, though shot on film, was limited to broadcast resolution or VHS for decades (unless you imported the Region 2 DVD, which is now long out-of-print). So I wasn't surprised to see the massively improved image provided by this new 1080p transfer, but I was surprised that it hadn't been pushed towards cyan/teal territory as is the norm these days -- especially since Michael Mann's Thief suffered that fate on Criterion's 2014 Blu-ray. Thankfully, the colors look exactly like what you'd expect from a made-for-TV film shot in 1979: earth tones are prevalent with noticeable amounts of grain, along with an extremely high amount of fine detail in close-ups and long shots. It perfectly captures the era of its production, so I for one am glad that The Jericho Mile looks exactly like it does here. Despite being a single-layer disc, it's encoded flawlessly with no compression artifacts or other digital issues. NOTE: The promotional images on this page, provided by Kino Lorber, do not represent the title under review. The audio is presented in its original DTS-HD Master Audio 2.0 (split mono) and sounds right in line with films from the era: dialogue and music are generally thin but offer occasional moments of depth, with well-balanced levels so you won't have to jump for the remote between quiet conversations and louder scenes. Unfortunately, no optional subtitles have been included; Kino is notoriously inconsistent in this department, and you'd think that it'd be almost required for all Blu-ray releases at this point. Kino's interface is smooth and simple, with quick loading time and separate options for chapter selection and extras. This one-disc release arrives in a standard non-eco keepcase -- but unlike a lot of recent Kino releases, the artwork is only one-sided and does not include a digital copy redemption slip. The main attraction here is a new feature-length Audio Commentary with film historian and author Lee Gambin, who spends a lot of his time discussing the film's race relations, cast, and Mann's early years in the industry. Gambin strikes a nice balance between discussing the production history and playing "spot the cameo", so those with a deep appreciation of the film and Mann's career will likely appreciate it just as much as casual fans. It's a very educational track that's well worth listening to, even if the addition of a moderator or first-hand participant would've smoothed things out a little. Also here is a completely silent Trailer (30 seconds - more of a teaser, really) that looks to be in good condition otherwise. Michael Mann's The Jericho Mile is a great debut from the up-and-coming director; it's a social drama first and a "sports movie" second, shot on location in Folsom Prison among its guards and inmates. There is no shortage of outstanding performances -- and though some of the clothes and slang have aged terribly, the universal themes and sleek narrative make this a quick, easy, and enjoyable watch every time. Kino's Blu-ray offers a top-tier A/V presentation that exceeded my expectations, while the new audio commentary adds value to an otherwise movie-only disc. Recommended to fans and first-timers alike.